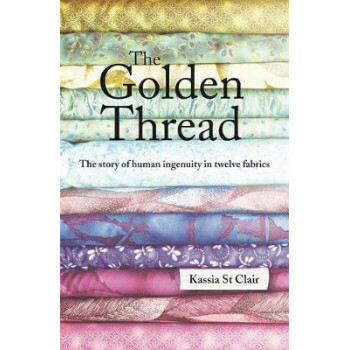 ** A RADIO 4 BOOK OF THE WEEK ** All textiles begin with a twist. From colourful 30,000-year old threads found on the floor of a Georgian cave to what the linen wrappings of Tutankhamun's mummy actually meant; from the Silk Roads to the woollen sails that helped the Vikings reach America 700 years before Columbus; from the lace ruffs that infuriated the puritans to the Indian calicoes and chintzes that powered the Industrial Revolution, our continuing reinvention of cloth tells fascinating stories of human ingenuity. When we talk of lives hanging by a thread, being interwoven, or part of the social fabric, we are part of a tradition that stretches back many thousands of years. Fabric has allowed us to achieve extraordinary things and survive in unlikely places, and this book shows you how -- and why. With a cast that includes Chinese empresses, Richard the Lionheart and Bing Crosby, Kassia St Clair takes us on the run with escaped slaves, climbing the slopes of Everest and moonwalking with astronauts. Running like a bright line through history, The Golden Thread offers an unforgettable adventure through our past, present and future.